Building a deck is an art form that Wyeth Woodworking and Remodeling takes very seriously. A screened porch or open deck can reinvent your backyard and landscape. 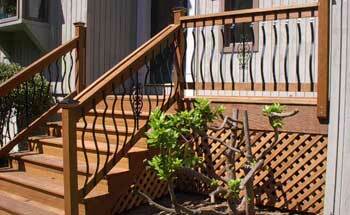 A deck can turn your property into a vacation destination or be the ideal place for a party or play space. Additionally, with covered decks, All-Weather & screen porches, you can literally enjoy the relaxing atmosphere year round. As with most home-remodeling, decks offer a chance to be creative while working within size constraints and your budget. Wyeth Woodworking and Remodeling gives you the power to customize your deck plans with designs ranging from classic to modern, while offering its expertise and advice on selecting the right decking material for your project. A Screen Room is a relatively inexpensive way to add family space without the additional work of laying an expensive foundation. This space can be created using a simple slab, some basic framing and sturdy screens, letting you enjoy the outdoors with some of the freedom of an indoor environment. Most screened-in rooms start at approximately $3,500 and increase in price according to flooring (slab) and electrical options and fixtures. A Sunroom can be added to an existing area or an existing area can be easily altered. There are as many styles and sizes as there are budgets. Wyeth obtains all of the necessary permits for your project and makes sure all required inspections are done so the project continues on the desired timeline.